Born in 1977, David Dibble was raised on a farm in Davis County, Utah, where he was influenced by the landscape from an early age. 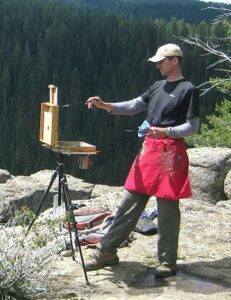 He completed a BFA in Illustration from Brigham Young University and began landscape painting in earnest in graduate school at the Academy of Art University. Following the Academy he and his wife Liz moved to New York, where he worked as a color artist for Blue Sky Studios (20th Century Fox), creating Concept Design for such films as Rio, Epic, Ice Age 4, and Peanuts. David and his family now reside in Orem, Utah, where he teaches Illustration at Brigham Young University and paints often in the surrounding mountains and valleys.